The following is a review of the product Root Boost Hair Thickening Spray which has been manufactured by Nanogen. The manufacturer of the product claims that it is a unique hair thickening spray that can lift every single root and thicken each strand. Read on to learn more about the ingredients of this product and whether or not it stands up to the claims made by the manufacturer. It is recommended that you spray your dry or damp hair generously from root to the tip. You can use it daily, and in order to activate the thickening proteins you can blow dry your hair as well. For best results you should spray it every time you wash your hair and afterwards you can style your hair as usual. The price of one bottle of this product is listed as $13 on the website of the company. The manufacturer of this product also offers free shipping on every order of $62 and above. The manufacturer of this product has not offered any kind of return, exchange or money back guarantee. This is really concerning because if you are not satisfied with the product and if you feel that it is not showing the desired results then you have no way of returning it or getting your money back. There are also no reviews of this product on the company’s website which makes it a questionable purchase. 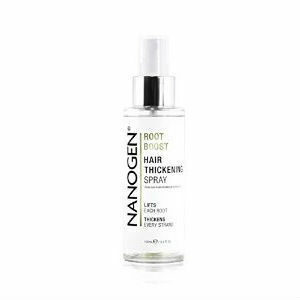 Root Boost Hair Thickening Spray which has been manufactured by Nanogen is a unique hair thickening spray that is absorbed quickly and according to the manufacturer it can help your hair gain instant volume and thickness. The manufacturer also claims that you can see visible results after just one use and that your hair will feel bouncy, big and full of life. The product also has heat activated proteins which can give your hair an extra boost if you use it with a blow dryer. Additionally, it is also free from SLS/SLES, Formaldehyde Donors and Parabens. However, the manufacturer of this product has not given any kind of return, exchange or money back guarantee for this product and there are also zero reviews of this product on the website of the company so you just have to take the word of the manufacturer if you choose to purchase it. If you are not satisfied with the results then you will have no way of getting your money back. So, to conclude it is safe to say that this may not be the best product for you. John Brownstone	reviewed Nanogen Root Boost Hair Thickening Spray	on November 20th	 and gave it a rating of 2.5.